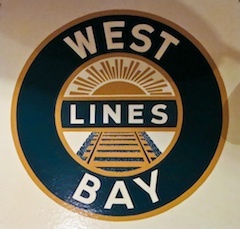 This weekend the West Bay Model Railroad Association is holding its annual Christmas Show – and the trains are running! If you’ve got kids (or even if you’re just a fan of model railroads like me!) you’ll definitely enjoy a visit to the club’s big layout in the Model Railroad building at 1090 Merrill St. – adjacent to the Menlo Park Caltrain station. The show is free – donations gratefully accepted. Doors are open until 6 PM Saturday, Dec. 10, and from noon to 5 PM Sunday, Dec. 11. Below is a quick 1 minute video of several of the trains in action this afternoon.